We’d love your help. Let us know what’s wrong with this preview of Your Rebel Dreams by Tikiri Herath. How would you like to do work you absolutely love and get paid for it? Come on a fun interactive journey of self-discovery to uncover your purpose and passions in life. Through a series of introspective exercises, this workbook will help you unlock your potential and transform your life. Identify your fundamental values and uncover your purpose in life How would you like to do work you absolutely love and get paid for it? Identify your fundamental values and uncover your purpose in life. Discover your innate talents and skills in line with your passions. Learn the kind of environments that bring out the best in you. Create a big audacious vision for your life in line with your calling. Your Rebel Dreams is a life-changing workbook that will take you on a journey of self-awareness where you get to explore the amazing things you’re meant to do. It includes questions in each chapter with space for you to write down your answers and thoughts. To ask other readers questions about Your Rebel Dreams, please sign up. This workbook is less about self-help and more about self-discovery. The quotes spread liberally throughout the workbook gave frequent nudges toward introspection. It is thought-provoking and designed to guide the reader through well-designed, user-friendly steps to self-realization. This is a thought provoking book that made realize that I had the power to change my future. The exercises were a perfect way to take an honest look at my dreams and passions so that I could achieve my goal. Your Rebel Dreams helped me understand what I wanted to do with my life. It was the beginning of my journey. I received a copy of this book which I voluntarily read and reviewed. My comments are my honest opinion. I’ve read a bunch of motivational and inspirational books, self-help workbooks etc. and this one definitely falls in the top 10 for me, which is saying something since self-reflection is still a new uncomfortable experience for me. This workbook starts off very aspirational and inspirational with the promise of bringing practical applications to help you discover your passions, your purpose, your vision for your life and I’d say the author delivers! There are lovely quotes by women, both well kno I’ve read a bunch of motivational and inspirational books, self-help workbooks etc. and this one definitely falls in the top 10 for me, which is saying something since self-reflection is still a new uncomfortable experience for me. This workbook starts off very aspirational and inspirational with the promise of bringing practical applications to help you discover your passions, your purpose, your vision for your life and I’d say the author delivers! There are lovely quotes by women, both well known and lesser well-known, but all perfect for where they show up in this book to inspire you and I think to help demonstrate just how many women role models are out there, though I’m sure there are many more, even within our own communities and families than are mentioned in here. There are live links to websites scattered throughout the ebook version that are great as resources specific to the discussion on hand, like personality tests, links to the free companion workbook (highly recommended to use to get the most value out of this book! ), places to find additional targeted information, etc. I love the workbook – you can download it and print it out as many times as you want to do it; do it now, do it again in a year or 2 years – whenever you think your desired vision for your life might have changed. The questions and sections match the book perfectly and walk you through the book as painlessly as possible. The questions are smart and broken down into bite-sized pieces, making it pretty simple to follow along. Caution: This book will direct you to perform self-reflection, potentially putting you into some mental discomfort or strong emotional states depending on how comfortable you are at this practice. This book asks you to examine in detail many different areas of your life… in particular, your values, your flair (what you’re good at), your zone (your ideal environment), your joy (mindfulness, gratitude) and your service (what value we give others), which can be painful for some to think about but this is all about you! There are no wrong answers, just greater personal insight into YOU to help move YOU towards your best version of your life. This book does target women as their key audience – all of the examples are about women, there are many references to feelings, emotions, the workbook even has a feminine feel to it, all of which I do enjoy as a woman. I do highly suggest following her recommended timing to tackle each section; having read through it faster and in a shorter timeframe initially; I will be going back through it using the workbook and incorporating her suggested breaks into the workflow to maximize the benefit I get out of this process. If you don't like self-reflection, or don't want to spend 2 months working through the process in this book, then this book is probably not for you, but in my opinion, this process seems foundational to anything you might want to achieve in your life and there aren't too many books out there (that I've seen) that are willing to spell out for you all the details, like Tikiri has done here. 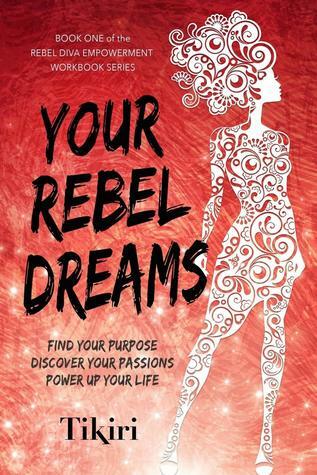 Your Rebel Dreams is the first book in a three-book series that's all about empowering women to find their purpose and passion and put a plan of action around that to make it all a part of your life. This first book is about finding your passion so you can have a better vision of the life you want to live. She defines passion as your Flair plus your Zone plus your Joy plus your Service. I'll explain these terms below, but all of this that makes up passion must be encompassed within your values. T Your Rebel Dreams is the first book in a three-book series that's all about empowering women to find their purpose and passion and put a plan of action around that to make it all a part of your life. This first book is about finding your passion so you can have a better vision of the life you want to live. She defines passion as your Flair plus your Zone plus your Joy plus your Service. I'll explain these terms below, but all of this that makes up passion must be encompassed within your values. This is a workbook, and she has a 100+ page file available for download so you can print out the questions, allowing you to answer them easily. Very handy for an electronic workbook. It's broken down into nine weeks of questions. There are a few introductory essays and ideas to think about before you start the official nine weeks as well. Uplifting short essays are also scattered throughout and appear at the end. She defines Flair as what you do well, your talents or what you're good at. Your physical environment, the people around you, and the information you will watch or absorb is your Zone. What you love doing is your Joy, and Service is what you can give to the world based your talents and skills. Week one is about values, and weeks 2 through 4 are about your Flair, your Zone, and your Joy. She gives three whole weeks to Service. Then she wraps up week nine by pulling these all together in one big vision for your life and having you make a pledge to yourself. At the end of each section, there is a brief check-in to see how you're feeling with the process. If you want to dig deep to find your passion and vision--or simply want to reflect things you do well, things you enjoy, or what you can do to help others-- this book is chock-full of encouragement, tips, and suggestions, as well as the exercises that get you thinking deeply about yourself. It will give you a great start to help you understand yourself if you want to move forward with living a life that is aligned with your passion and vision. I look forward to reading the rest of the series. This book is phenomenal! I read the whole book, without doing the exercises, so that I could finish and review. Even without doing the exercises, I came away with a renewed sense of purpose and energy. This book is written for real people; no platitudes or empty promises. You have to work for your dreams, but they are possible. She gives some great advice, asks some really good, and sometimes tough, questions, and points you in the right direction. There is a lot of encouragement throughout the This book is phenomenal! I read the whole book, without doing the exercises, so that I could finish and review. Even without doing the exercises, I came away with a renewed sense of purpose and energy. This book is written for real people; no platitudes or empty promises. You have to work for your dreams, but they are possible. She gives some great advice, asks some really good, and sometimes tough, questions, and points you in the right direction. There is a lot of encouragement throughout the book, real world examples, and lists of places to get some of your questions answered. This was a very eye opening book. Women need to read these words and think about them. The workbook is so well done and it makes you think seriously about where you are in life and where you would like to be. Highly recommend this book to every woman. What a great workbook for self-discovery. I especially loved the quotes and shared several of them with friends and family. I looked forward to my time spent in self discovery and recommend every woman pick it up, slow down and enjoy where your contemplation takes you. I thought this book was really good at getting you to think about where you are in life and make goals to get to where you'd like to be. I think it would be more beneficial to get a print copy of this book, since you should write things down. Also, I would have liked a longer time to do the exercises. I felt rushed getting it done for this review. I think this will give women great empowerment. I received a free electronic copy in exchange for an honest review. User friendly workbook that guides the reader in self evaluation. Useful tool for those seeking to find direction and purpose in their lives. This workbook was wonderfully written. Very pointed questions that almost force you to take a step back and think in the materials presented. A definite must have for anyone interested in continued self-growth, exploration and understanding. The quotes provided were relevant to the material and also really stick with you. Women sometimes need to read uplifting words like these. I recommend you give some thought as you’re reading this. Tikiri is an award-winning author of the Red Heeled Rebels suspense novels and the Rebel Diva empowerment workbooks. When she’s not writing, she’s in her kitchen cooking up fusion cuisine with a glass of red wine in hand. She’s also an adrenaline junkie who has rock climbed, bungee jumped, rode on the back of a motorcycle across Quebec, flown in an acrobatic airplane upside down, and parachuted so Tikiri is an award-winning author of the Red Heeled Rebels suspense novels and the Rebel Diva empowerment workbooks. When she’s not writing, she’s in her kitchen cooking up fusion cuisine with a glass of red wine in hand. She’s also an adrenaline junkie who has rock climbed, bungee jumped, rode on the back of a motorcycle across Quebec, flown in an acrobatic airplane upside down, and parachuted solo. She has lived and worked on four continents and holds a Bachelor’s degree from the University of Victoria and a Master's from the Solvay Business School in Brussels. After a lifetime of global travel and work, Tikiri is now a recovering nomad who calls Vancouver, Canada home.